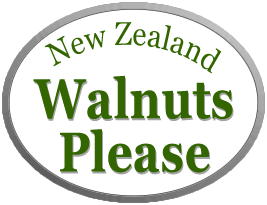 Snack on walnuts straight out of the shell or on a pack of walnut pieces. Also try some of these delicious recipes. This is like a Christmas truffle but in a log instead of in small balls. It’s so easy to have on hand in the refrigerator and just cut off a few slices to have with coffee or bubbles when friends come round. Place walnuts, figs, dates, peel, cinnamon and chocolate in a food processor. Pulse the machine to mix and chop to a coarse consistency. It should be sticky enough to mould together but coarse enough to have distinct and interesting texture. Place a sheet of cling wrap on the bench and place about a third of the mixture in a compressed log along the middle of the wrap. Roll the wrap around the log and fold in the edges, then roll and press into a smooth roll. Just before serving, unwrap and dust with icing sugar. Repeat twice with the remaining dough. Easy to nibble with the extra flavours of rosemary and paprika, great as a snack served with drinks. Preheat the oven to 180ºC and melt the butter and oil in a large roasting pan, then add the nuts and toss lightly to coat. Spread out the nuts to form a single layer, then sprinkle with the rosemary, paprika and salt. Bake for 20–25 minutes, shaking frequently, until they are browned. Take care not to overcook them: they can easily be scorched and spoiled at this stage. Tip on to paper towels and allow to cool. This is a classic French dish and is traditionally served on toast. Put all ingredients into a food processor and whizz to a chunky or smooth consistency depending on your preference. Chill for at least 15 minutes in the refrigerator. Serve on pieces of toasted bread. Chocolate walnut log or truffle with ginger and a tasty walnut crunch in the middle. Lovely with coffee. Form into balls with a walnut half in the middle of each ball. (Or shape into a log with walnut halves all along the middle so that when you slice it you will have some whole walnut in each piece.) Roll the balls or log in coconut or poppy seeds as desired. Cover with cling wrap and chill in the refrigerator. Attractive twist on an old recipe. Hard boil the eggs and allow to cool completely. Shell the eggs and cut them in half. Remove yolks and mash with the mayonnaise, mustard and chopped walnuts. Fill the egg halves with the mixture and press a walnut half on top of each. Cover with cling wrap and chill until required. Toast the walnuts at 170ºC for about 7 minutes. Allow to cool completely. Heat the oil in a large pan and sauté the onions, celery and bay leaf. Stir in the beans and turn off the heat. Cool, then remove and discard the bay leaf. Put the bean mixture, walnuts, garlic and herbs into a food processor and whizz until the consistency is smooth or slightly chunky, depending on your preference. Season with salt and pepper. Divide into ramekins or shape into a log, then refrigerate for an hour before serving. Can be stored for up to 3 days in the refrigerator. Add 150 g cream cheese when you are whizzing the ingredients in the food processor.